The Ypsilanti area has been home to The Color Run – a non-competitive 5k – for two years. Each race brings more than 15,000 runners and thousands more spectators. The estimated economic impact of visitor spending at this event is approximately $2 million. The creation of a Visit Ypsilanti’s Color Run Page with information about packet pick-up, businesses listings with map, hotel availability, parking information, and more. Used as the main referral page for The Color Run event organizers. Event and informational poster design. Social media promotions prior to the event including Facebook ad buys and ticket giveaways. 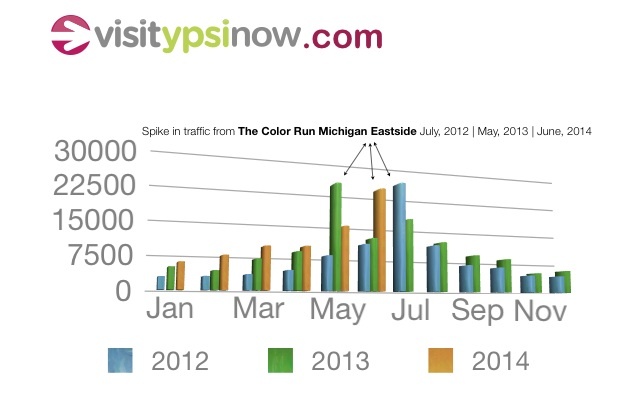 The Color Run page on visitypsinow.com continues drive the largest amount of referral traffic to the website.